It is important to remember that William was in effect, a man of no means. Among the many branches of our family tree, William is probably one of my favourite characters. His life from the get go seemed to be tenuous with a slim grip on the likelihood of him surviving. The fact that he achieved as much as he did; in my books makes him someone I would very much have liked to have known. William was born on the 13th June 1809. Hawkesbury Pioneer Records indicate he was born in Ireland however this could as easily have been England so I’m not taking it for gospel just yet. His parents were Patrick John London who appears to have been known as John, and Sarah Lodon. Around the same time that little William was orphaned the Reverend Samuel Marsden who was not only the cleric representative of the Church of England in Sydney but also the Magistrate was lobbying the city fathers to do something to manage the growing need of orphaned and abandoned children whose numbers grew alarmingly. The proposal was that these children be brougth to a dedicated orphan school and given a basic education until they were old enough to be apprenticed out to a master who would provide them with training and in some cases a craft from which they would be able to draw a living. Obviously this really only applied to the males as women from this class were considered domestics at best. The children would be removed from the streets and given tutelage as God fearing citizens. In return for this care the children entered a contract with their masters called an indenture. They worked for these masters until the time their indenture ended. They received food, lodgings, clothing and a trade in return. Like me do you suspect that some of these arrangements may not have necessarily been to the children’s best advantage? Some unscrupulous arrangements were made where the boys (and girls) ages were adjusted slightly to ensure the indenture may have lasted an additional year or two where the child was required to continue at their masters bidding. The children had almost no say in what arrangements were made on their behalf and no money of their own. Acceptable employment for these children was labourer, servant and domestic. The luckier ones may have actually gained a trade. It was difficult for a child to be removed or returned home (if they had one) as these arrangements were made to facilitate the workforce of the colony. The children admitted were orphans and children of the destitute and those abandoned by their family. On the first day of opening the average age of admission looked to be around ten years. In William’s case he is reported in the Governor’s papers as being recommended to enter the New Male Orphans School in George Street, Sydney. The previous incumbents being the female orphans who were relocated. William’s guardian is listed as Morris Halligan of Appin NSW. The Male Orphan School opened in conjunction between Governor Macquarie and Reverend Samuel Marsden. On its first day of opening; 1st January 1819, William was admitted as the 32nd pupil to the school/orphanage. In 1824 the boys were moved to a new school on a farm in that part of the Liverpool district which would later become Bonnyrigg. William was included in this move. The School was governed by the Clergy and School Lands Corporation and from 1833 came under the control of the Colonial Secretary. The school closed in 1850. In March and again in April of 1822 William ‘quit’ school and ran away. Each time he voluntarily returned. On the 8th October 1823, 14 year old William once again ran away with a schoolmate, Samuel Ogden. He spent the day away and returned at night. The Master of the school records that as this is his third offence he was to be punished by being flogged! During the April of 1826, 16 year old William left the school for the last time. He was recorded as being discharged. I visited the site in George Street in January of 2014 expecting to see nothing but a bustling city street corner. To my absolute delight I found an archaelogical dig of huge proportions underway. It would appear that today’s Sydney has recognised the huge vault of history that the site sits on. To date artefacts from the school and the original Aboriginal people have been carefully excavated and are being preserved for future generations. It made me feel immensely proud that one of my forbears who despite having a rough start in life was in some way having their modest early beginnings honoured and preserved as part of the Australian story. What became of William between the ages of sixteen and when he reappeared at the age of thirty one, I’m not sure. Did he get apprenticed out? There is only 38 kilometres between Bonyrigg and the Hawkesbury. Was the nearness of the Hawkesbury and labouring work being available what made it attractive to William? Either way, he left Sydney behind and did not return there to live. Understanding where William and his family set up home is helpful in being able to understand their lifestyle and challenges. The area was nominated by Governor Macquarie following a scouting parties report as being an area ideal for growing food for the colony. At this time the colony was in dire need of becoming self-sufficient or it would surely founder. By 1794 the first twenty eight settlers were moving into the Hawkesbury. I visited the area in 2014 to get a better understanding of these places and their poetic names that vary so much in the London family lore. 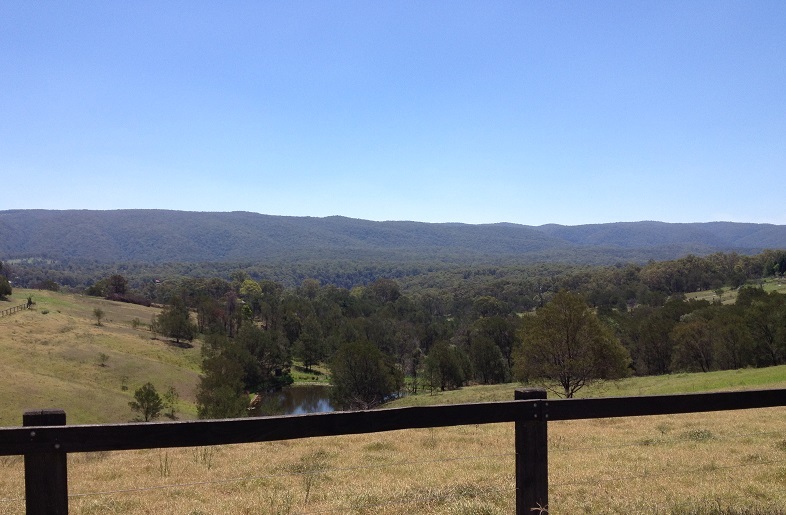 The land around the Hawkesbury where William and his family resided is indeed fertile and lush. What you can’t see is the many hours of backbreaking labour with basic tools that would have gone into clearing the land for agriculture. Regrettably there was also the clearing of its original owners the Kamilaroi or Gamilaroi people. There was resistance from the aboriginal people quite understandably as this was their homeland. This must have been a horrendous time for them and a deeply saddening time to lose their own history. As was the practice of the times they were forcibly removed from the land. The best of the land was apportioned to the English settlers or free-men. Men of finance and good-standing were given the pastures and nearest water sources. As a result they did particularly well in a very quick time frame. The land was ideal for orchards and vegetables and raising meat. These early pioneers would have had their challenges surely but their lot was made considerably easier also by their access to convict labour and financial means to set themselves up in business. They also had the backing of Macquarie who had put his full support behind making this venture a success. Within a few years Sydney and its people were being supplied by the food bowl that became known as The Hawkesbury. It is important to remember that William was in effect, a man of no means. An orphan with a penchant for running away probably led to a fairly resiliant character. Other land in the area that was considered not quite so attractive and was on the slopes of the hills, giving way to names such as The Slopes and the much maligned Sally’s Bottom. This land was made available to those who perhaps were not quite so financial. Freed convicts and settlers who could take up the challenge to make something of this remaining bounty. Names that were allocated were quite diverse, some of these remain today and other’s for the sake of modesty were changed. Sally’s Bottom (which I adore) became Sallis Flat or Sallias Flat even Sallais Flat. Today it is a more sedate Tennyson. Comleroy Road was named for the part of the road it occupies and not its destination (Comleroy). Kurrajong is an Aboriginal word. The Slopes is fairly obvious to even the most obtuse of us. Travelling this area I immediately fell in love with the panoramic vistas and curly corners. I could imagine those days where the hillsides were covered in fruit trees of all descriptions and how easily the farmers children must have been able to reach down for a piece of windblown fruit and be immediately refreshed and fed. No cold stored food for months for these folks! Regrettably those days are gone as are the fruit tree orchards. The area now is peppered with lush looking farm homes and country homes. I doubt that our William could afford one of these sought after locales today with only a bit of good luck and determination to line his pockets. William first turns up in the Hawkesbury with the available Hawkesbury pioneer records that I have found on the 15th November in 1841. He married Miss Diana Riley who was born in Parramatta. William was 32 years of age and Diana 17, they were married at St Matthew’s Presbyterian Church in the nearby bustling town of Windsor. Diana was the daughter of an ex-convict Catherine Latimore from Birmingham in England and John Riley one of the first Europeans born in Sydney, whose own mother was also the convict Susannah Nairn. From these quite humble beginnings the new London family begin their lives in the Hawkesbury. Diana’s family had moved to the Kurrajong when her parents acquired land on the Comleroy Road. The Riley family were one of the first white families to settle in the area. On the 5th December 1843 William and Diana welcomed their first child a daughter Catherine who was baptised at St Peter’s Church of England in nearby Richmond on the 8th January 1844. The family were recorded as living at Boggy Swamp/Putty and William’s occupation given as Stock-keeper. Boggy Swamp and Putty were the names of stock route resting places along the Comleroy Road. The bullock drays would travel approximately ten mile per day laden down with their load before stopping at the next rest point. It must have been a long and arduous journey getting the produce down to be shipped off to Sydney town. Their first son William John London arrived on the 1 March 1846 and was also baptised at St Peter’s Church of England in Richmond on the 7th of June 1846. By this time the family have moved to Kurrajong and William’s occupation was given as a Labourer. A second son Robert, arrived on the 21st October 1848 and was baptised on the 19th of November in 1848 also at St Peters. William’s occupation was given as a Farmer. Things must have been starting to look up for William and Diana by this stage. Their daughter Sarah was born on the 20th October 1850 whilst they were living at Yango where William was a Grazier. Sarah was not baptised at St Peter’s Church of England in Richmond until the 2nd February 1853. Yango is one of those names that seems to have disappeared off the map over the course of time. Given that two children were baptised on the same day a few years apart, it’s possible that Yango was an area further away from Richmond and that the London’s may have moved there for work. The family brought in the new year with a son Albert born on the 1st of January 1853 while the family were living at Swann. Swann like Yango seems to have been an old local name. William was still a Grazier. Albert and his older sister were later baptised on the same day at St Peter’s Church of England in Richmond. In 1855 another son Henry was born on the 14th August. Like his siblings he was baptised at St Peter’s Church. The family were recorded as living at Kurrajong where William is again recorded as a Farmer. In 1858 a daughter Diana is born. No visible record exists for her at St Peters. However it is likely that she would have been. 22nd June 1860 saw the arrival of Elizabeth Ann. She was baptised at St Peters on the 29th August 1860. The family were still living at Kurrajong with William giving his occupation as a Farmer. Emily Jane was born on the 16th November 1862 and baptised at St Peters on the 8th February 1863. At this time William was a Farmer and the home location recorded as Howes Creek/Sally’s Bottom. A further son John Edward is recorded in 1865 but no visible records exist for him at St Peters. From cross checking records it appears that all of William’s and Diana’s children (as recorded above) reach adulthood. No small feat in those days. Somewhere along the road, William had acquired the local nickname of “Bill the Native”. This is recorded in an article “Some Ups and Downs of an Old Richmondite (Mr Alfred Smith), chronicled by Mr Robert Farlow for The Gazette. I would dearly like to know how William acquired this elaborate nickname and wonder did his early days of nicking off from school show a man who would rebel against the social norms? Was he living so far out of genteel Richmond on the Comleroy Road at Kurrajong that he was considered to be out the back of beyond? Had he had his fill of city life and city strife as a child to want no more part of it? On the 2nd August 1865 an article appears in the NSW Police Gazette. A John Turner had been caught stealing a horse from William who is listed as residing at Kurrajong. The horse is recovered and a trial committed to be held at Windsor. On the 30th December 1877 tragedy came to the district; William died as a result of a Typhoid outbreak at his son Robert’s home at Sally’s Bottom/Sallias Flat. Christmas was a terrible time for the family this year with many deaths of both adults and children, family, friends and neighbours. I could not hope to recount the events with as much effect as the following article. The Ravages of Typhoid at Kurrajong FURTHER AND FULLER PARTICULARS (From the Evening News’ Special Correspondent) Richmond, Saturday evening. I have now visited the whole locality that has felt the ravages of the dreaded typhoid, and am in possession of fuller and more reliable particulars, and I find a shocking state of affairs. From Richmond I got Mr. Houghton to drive me to Kurrajong. At the town off the Colo Road, I procured a horse from Mr. Charles Stanford, and proceeding along a road on the summit of a range for one mile, turned off beyond the Wesleyan Chapel, at the house of Mr. T. John, down a steep lane. Here I came on to the party preparing to put up seven Government tents for the sick people, and I interviewed three of the sick people. From one of those, who had just recovered, I received the following account: – Edward Mitchell, a finely- built young fellow, evidently suffering from fever, said: “I live on this farm, and cultivate it, but for the last few months I have not been able to do anything. That is the reason you see it so much neglected; the sickness broke out about three months ago. Mrs. Robert London took it first, then her little boy about three years of age fell ill; this was three weeks before Christmas. The next to take it – almost the same day as I fell ill – was Mrs London’s own sister, Margaret Overton, 18 or 19 years of age. Thomas Tierney got ill three or four days after me; then my poor old mother, MrsOverton (she was married twice), was struck down in a few days. My wife, Mrs Mitchell, and my half-sister, Elizabeth Overton, 17 years of age, fell ill in a day or two. My stepfather, Mr James Overton, got the typhoid fever, and we buried him yesterday. The next one who took it was my full married sister, Mrs Mary Ann McCabe; she is dead too. The great misfortune is, she was a widow and leaves eight children un-provided for, because their father and mother now are dead. The hut was deserted, but under a row of peach trees were found human beings suffering badly. They were Mrs Overton, an old woman 61 years of age, and her daughter. Thomas Tierney, a young fellow about 23, was crawling between the trees on his hands and knees. A perfect skeleton, sitting listlessly on the grave, was a very little girl. All the food was removed from the hut and scattered on straw outside. On her breast I found her little girl, two years and three months old, also very ill with the fever. The poor woman is Mrs Michael Tierney, a resident of the Orange district. She had come down to nurse her son Thomas, and caught the disease while attending him. I should suggest to the Colonial Secretary to quarantine the place, burn down the hut, and provide complete new clothing. Bed clothing is required at once. TELEGRAPHIC INTELLIGENCE (from the Herald, Echo, and Evening News.) RICHMOND. Saturday. [Evening News. ]-A public meeting was held at the School of Arts, last night convened by the Mayor, to take steps to afford prompt relief to the sufferers. It wasn’t until early April of 1878 that the Maitland Mercury reported an end of the typhoid outbreak that had claimed so many lives. A correspondent gives the Evening New further particulars of the pestilence of typhoid at that part of Kurrajong, recently described by its special correspondent. The fell complaint continues its ravages; all attempts to get rid of it have failed. The last fatal case is that of George Tierney, a fine young fellow of 22 years. Since the outbreak of the disease this young fellow has employed himself assiduously in attending to his suffering friends and relatives, and it was while engaged in his faithful work that he fell a victim to the complaint. He became ill a few days ago, and notwithstanding the skill of Dr. Jukel, and the unremitting attention of the Sydney nurses, he succumbed to the effects of the attack. He died on Thursday, and was buried a few hours afterwards. In the case of the man Overton, there are some very painful and strange circumstances. The body was allowed to remain uninterred for rather a long time, – until indeed decomposition had completely set in. The fever-stricken inmates of the house were compelled to leave it, being unable to remain with the body, and crawling out as best they could, sought refuge under a cluster of peach trees. The undertaker was unable to obtain assistance in burying the body, placed it as best he could in the coffin, and committed it to the grave. It is stated that next day the relations and friends of the deceased assembled on invitation in goodly numbers to attend the funeral, and pay their last tribute of respect to the deceased. Slowly and reverentially the cavalcade followed the hearse to the burial ground at North Richmond a distance of a few miles. On arriving at the ground they found to their surprise that they had been following an empty hearse. The body had been interred at least twelve hours previously. Our correspondent, referring again to the complaint and its ravages, states that several persons are still suffering, and that three at least are not expected to live, among them being that devoted woman who came down from Orange to attend her son, and was herself attacked by the disease. There is every ground for the demand that the place should be quarantined. Of William’s children; his daughter Catherine (Norris) married a neighbour Thomas Norris and lived her whole life in the Kurrajong dying at the age of 67. William John London (my 2nd great grandfather) went on to have quite an exciting and some might say a bit of a wild life of his own in the Kurrajong dying in North Richmond aged 85. Robert London, his wife and one of his children very sadly died in 1877 at the age of 29 as a result of the typhoid outbreak. Sarah (Dover), (Hitchenor), went on to marry Cyrus Dover and then William Hitchenor before dying at the age of 57 in Richmond. Albert London married Rosetta Turner and later tragically shot himself aged 44 at Sallai Flat. Henry London married Mary Jane Turner and lived his whole life in the area before dying at Richmond aged 73. Diana (Bottle) married local neighbour Henry Bottle and died aged 78 in Richmond. She was rather fondly known in the district as Granny Bottle. Elizabeth (Douglas) married William Douglass and died in Richmond aged 78. Hannah (Knight) married George Knight and lived and died in Richmond aged 89. Emily Jane (Gow) married William Pashington Terry Gow. She died in Richmond aged 87. She was the last of William’s children to die in 1949. The only child who moved away was John Edward London who married Everleen Sylvester and moved to Quirindi NSW. He died in Bankstown aged 81. William’s wife Diana lived on to a great age and died on the 26th July 1905 in the township of Richmond. In the Windsor & Richmond Gazette, Diana’s passing was reported on the 5th August 1905. It is important to remember that William was in effect, a man of no means. An orphan who had been largely discarded with a penchant for running away from his guardians. At the time of writing this, I am still seeking information about William’s family, there is no record found to date of his parents being convicts . One great thing about Europeans into Australian history is that records of convicts were very well recorded. Settlers, soldiers and ships crews not so much. The reason for this is that Convicts were a financial asset. Thanks so much Vicki. I’ve sent you an email! Hi- I found the story of William London very interesting. There is some many familiar names in your article. I am also one of his descendants, His son Henry who married Mary Jane Turner is my great grandfather. Henry also lived on The Slopes where my father was born in November 1914. Dad and his older brother lived with their grandparents on the Slopes and attended Comleroy School until their grandmother died died in 1923. They then left Kurrajong and went to live with their mother in Sydney. Thank you for this information. Little nuggets of information frequently prove exceptionally useful wen tying together loose ends. With thanks. Darienne. I came across your story this afternoon while searching the internet for William London, who I am a descendant of ‘”Diana London married local neighbour Henry Bottle and died aged 78 in Richmond. She was rather fondly known in the district as Granny Bottle.’ Diana was my fathers Grand Mother”. I still live in The Slopes on Slopes Road. My Father is Ernest Bottle, his Father was William Claude BOTTLE, son of Diana & Henry Bottle. Hi Deborah, I always smile whenever I read anything about Granny Bottle, she sounds like she was highly regarded and must have been a wonderful woman in the district. I have found references to her in the Hawkesbury Historical Society as having been a favourite in the Richmond/Windsor locale. Happy to share anything I find. Also, suggest you follow up with http://www.kurrajonghistory.org.au/, they have so much wonderful information. Hi, Allen London (Vicki’s cousin) here, the most recent info we have been able to find a state library. John (Patrick) London arrived on the ship Anne with Sarah and son William. John (Patrick) was part of the 73rd regiment on foot that were sent out to assist governor macquarie with issues arising from the unrest during the rum rebellion. i am having trouble finding info prior to their departure from the UK. Hi Darienne, my husband is Patrick John London 3rd great grandson. Emily Jane London married William Pashington Terry Gow, these are my husband’s great grandparents.I live 15 minutes drive from St Peter’s Cemetery at Richmond and have been taking photo’s of our family headstones and trying to clean up these graves. I love your story about John and where he lived, you so echoed my thoughts of the places he had lived and died. I am very new to this all but as I live near the cemetery and most willing to help. Do you have a grave site in the cemetery for John? My husband has 4 generations in St Peter’s. Thank you Margaret for your kind words. It is always nice to meet another like-minded soul. Your work with the grave recordings and restorations sounds fantastic. I wonder if you had any photos you wanted to share on the website? If so, I would be deeply appreciative and grateful. I live in Victoria so am not nearby and have only ever been to the Kurrajong the once , two years ago after which I started up the website. I rather think following the 1877 Typhoid outbreak that a lot of the graves would be close together from that generation? I wonder did they all get markers though, given that there were so many deaths in such a short time? Our (Patrick) John I was able to track down as most likely being right under Sydney Town Hall, which was originally the site of the first Sydney burial grounds. When I was there doing some research in 2014 they were pretty sure that that is where he was. The land was reclaimed some years later and eventually the Hall went up over it. They were doing some research on the site themselves at the time. It was quite interesting to talk to them. Look forward to hearing how you are getting on. Cheers. Darienne. i know this is short notice but i am in Windsor this weekend 28/10 -31/10 doing some research on William and Diana London. I’ve done some look ups for your on Ancestry.com.au and I can tell you that Owen Tierney aka Tiernan was convicted in County Meath in Ireland and was born 1780. He came out on-board the Friendship as a convict. Owen had been given a life sentence but was given a conditional pardon on the 18th April 1811. In 1822 Owen leased 30 acres of land at Windsor. Owen married Mary Langridge another convict in 1830, they already had had a family togeher by that stage. Owen is mentioned as a settler on the following: http://hawkesburyheritage.blogspot.com.au/2013_07_01_archive.html. owen died 24 August 1831. If you have a look at my page https://dcaldlan.com/familiar-faces-and-interesting-places/ you will see a lot of links to different groups in the Hawkesbury region that I am pretty sure is going to put you in the right direction. As an early settler/pioneer the Hawkesbury group is going to have a lot of information on the Tierney’s. I know the Tierney’s went onto be a large Catholic family in the area. However I can’t tell you much more as its not my line and thus I haven’t been tracing it. However, best of luck and it is very addictive this family research stuff 🙂 Darienne. John Riley (Jnr) born about 1822, met Catherine Beckett (nee Reynolds) about 1842 & died 1907 in Warialda (my ancestors). Diana Riley born 16 October 1824 in Parramatta-NSW, married William London on 7 November 1841 and died 26 July 1905 in Richmond, NSW. William (aka William the Native) born 1809 in Ireland, died 30th December 1877 as a result of a typhoid outbreak at their son Robert’s home at Sally’s Bottom/Sallias Flat. Many family, friends & neighbours also died from the outbreak (source: dcaldlan.com). Susannah Riley born about 1826 in Prospect-NSW, married Edward Wilson on 1 April 1847 and died 23 June 1905 in Kurrajong, NSW. Elizabeth Riley born 6 April 1929 in Prospect-NSW, married Timothy Wilson on 30 March 1848 and died 3 November 1882 in Kurrajong, NSW (Edward and Timothy Wilson were brothers, their father Job Wilson was a convict and their mother Elizabeth Ann Rodgers, was the daughter of convicts; John Rodgers and Elizabeth Celey). Edward Riley born 12 November 1832 in Prospect, NSW, married Mary Ann Delaney on 25 February 1854 and died on 21 May 1914 in Kurrajong. Martha Riley born 2 February in Colo, NSW, married three times (1) Thomas Wright on 17 May 1852 (2) John Turner on 16 January 1862 (3) Thomas Matthews on 10 September 1881 and died 20 June 1917 in Gulgong, NSW. HI Theresa, hopefully you can find some helpful information for your research. I’ve checked on my ancestry.com.au tree and have found the following as siblings of your grandmother. (1) Oswald George London 1888 – 1923, (2) Hector Clarence London 1890-1972 (3) Mabel M London 1891 – 1923, (4) Olive Frances London 1893-1900, (5) Vera Emily London 1894-1943, (6) Henry Darcy London 1896-1970, (7) Mary Alma London 1899-1970, (8) Una Holly London 1901 -1938, (9) William Bryce London 1904-1954. http://person.ancestry.com.au/tree/23198677/person/12370572196/facts. I hope this is of some help for you. Cheers. Darienne. Hi Darlene, thank you for the info on my grandmother’s siblings. I have met only one of them and knew of some of the others. Mary Alma married William Buttsworth son of Glen Buttsworth. I think Glen had a fruit orchard mainly apricots at Richmond. Thank you for your kind words Lindy, you are very welcome. It gives me great joy to share. Kind regards. Darienne. This sentence somewhat threw me for a loop!! I think the William PT Gow referred to above must be the son of the William PT Gow I am researching who was my great, great, great grandfather. I am currently struggling with finding definite proof of William PT’s parents. Most websites have him as the son of a certain John Gow who was the son of Niel Gow, a renowned fiddle player and composer from Inver in Scotland. I am absolutely “in love” with the idea of being descended from Niel Gow, but need to find the proof. Interestingly when doing a wide search Niel Gow popped up on mine as well, definitely worth following that one down. Sorry but I can’t give you any more than what I’ve already got on Ancestry for this one. Hope this helps somewhat? Sounds like an interesting lead though. There is still a lot we don’t know about Sarah and Patrick and at this time for me they are brick-walls. I suspect that he might have been a soldier come to work in the colony as she was no convict or convicts wife. Other than that it is a bit of a mystery. Cheers. Darienne.